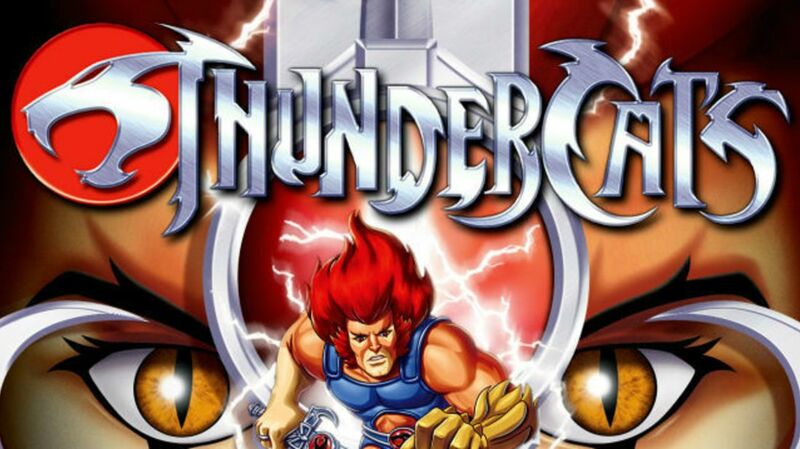 15 Amazing Facts About Thunder ... Thunder ... ThunderCats! Thirty years ago, millions of children (and more than a few adults) became obsessed with ThunderCats, that quintessential ‘80s cartoon about a race of sword-wielding cat people who arrive on Third Earth to protect its inhabitants from the evil Mumm-Ra. Created by Tobin Wolf—a World War II veteran who also invented the first portable record player for teens—and produced by Rudolph the Red-Nosed Reindeer masterminds Rankin/Bass, the series ran for 130 episodes, long enough for its theme song to take up permanent residence in brains across the globe. Want to know how a staff psychologist, Lionel Trains, Gumby, and Superman factor in to the show’s history, all while being spared any mention of terminally cute sidekick Snarf? Read on! 1. Producers targeted their advertising to parents. Skittish over criticism that cartoons of the era were violent and existed solely to sell toys, Telepictures (which owned Rankin/Bass) took out print ads in advance of the show’s 1985 debut that extolled the virtuous nature of the series. 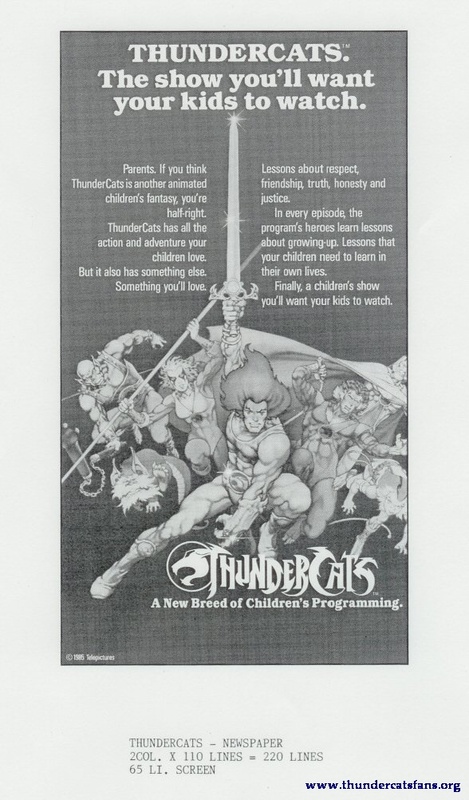 “ThunderCats has all the action and adventure your children love,” the copy read. “But it also has something else … lessons about respect, friendship, truth, honesty, and justice.” Another ad acknowledged that, while parents try to raise their kids correctly, “sometimes you need help.” From a cartoon, apparently. 2. A staff psychologist reviewed every script. 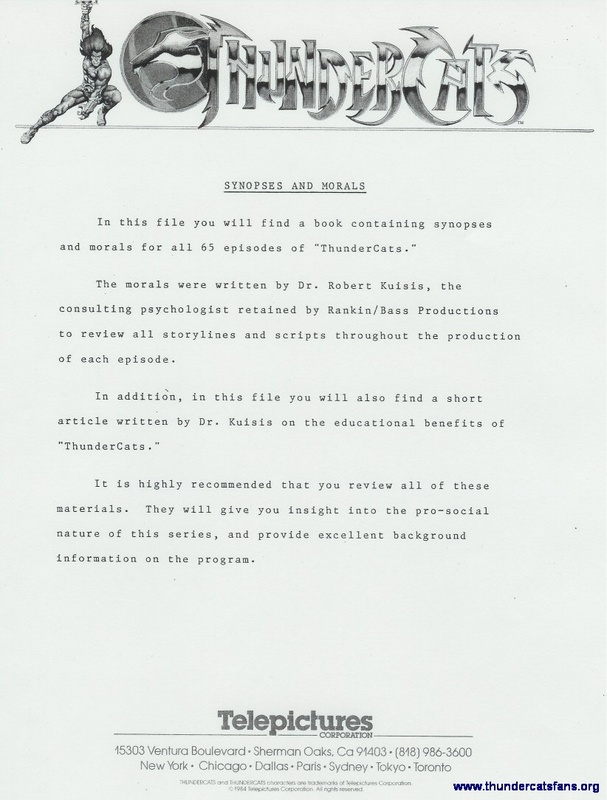 To make good on their promise to adults, ThunderCats producers employed a psychologist, Robert Kuisis, Ph.D., who evaluated every script to make sure a strong moral lesson was being imparted in each episode. Kuisis even wrote brief reports on the first 65 installments for station affiliates to read. 3. Lion-O was originally Lion-L.
Head writer Leonard Starr, who was brought in to flesh out Wolf’s concept, remembered that the flame-haired leader of the group was dubbed Lion-L in an early outline for the show—until some forward-thinking producers pointed out they could have a head-on collision with Lionel Trains in both toy aisles and a courtroom. 4. There was a live arena show co-starring Gumby. With ThunderCats quickly rising to the top of the syndicated ratings, Telepictures decided to mount a traveling stage production top-lined by Lion-O and company that blended several Rankin/Bass properties in one show. Since they had possession of Gumby, that meant the green glob and Pokey were on hand to act as the audience’s hosts, moving from one “world” to the next. On roller skates. 5. The show became actual homework. 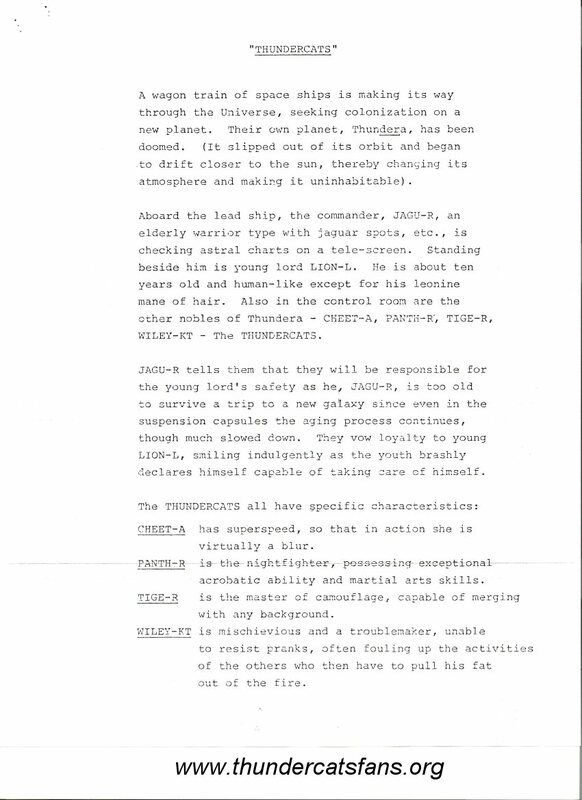 In an effort to drum up positive publicity for its debut, Telepictures produced 40,000 study guides for grade-schoolers that effectively assigned ThunderCats as homework. 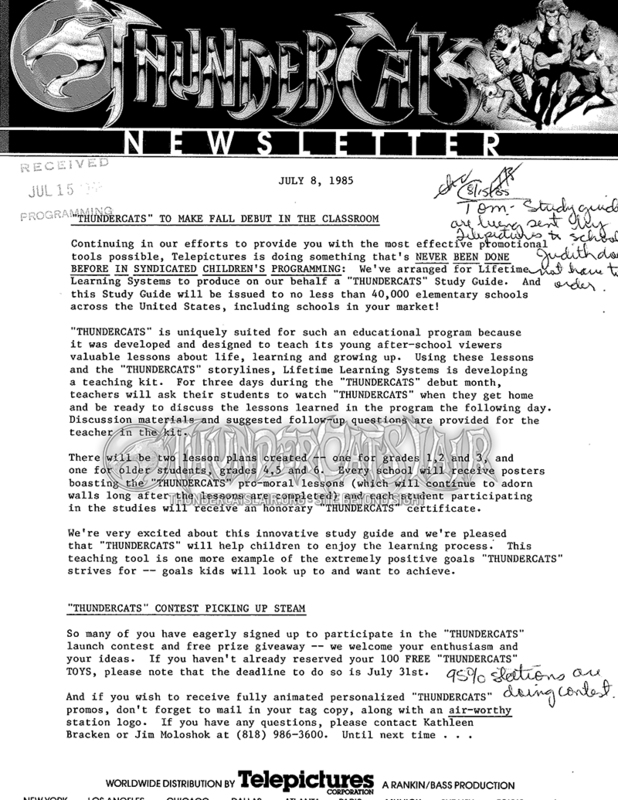 “For three days during the ThunderCats debut next month,” the information sheet read, “teachers will ask their students to watch ThunderCats when they get home and be ready to discuss the lessons learned in the program the following day.” Participating students received a certificate; parents were likely dragged into the toy store. 6. Jules Bass didn’t mince words. Bass, one-half of the Rankin/Bass animated think-tank, was the boss in the ThunderCats production offices in New York City. According to Peter Lawrence, showrunner for the series, Bass’s management style was about as gentle as a scouring pad. “He really pushed us,” Lawrence tells mental_floss. “Someone was behind on approving storyboards. Jules walked in, looked at them, and threw them in the trash. ‘Done. Next.’” Bass also wrote several episodes under his pseudonym, Julian P. Gardner. 7. It was surprisingly hard to find writers to work on the show. Not too many animated series were based on the East Coast in the mid ’80s, leaving Lawrence hard up for script writers. “It was quite amazing,” he says. “We had a ton of work and no agencies were responding.” Once the show debuted, things changed. Until then, Lawrence recalls dragging in audio engineers and other peripheral staff to try their hand at writing. Lawrence recalls Pacific Animation, the umbrella label given to the Japanese studios that drew the series, had a cultural aversion to saying no. “We’d ask if something was possible and they’d say yes,” Lawrence says. “Then we’d get it back and it would be completely different.” They also disliked when writers would indicate a “horde” appear in a script, dreading having to animate a crowd of people. 9. Writers sometimes had to write toys into scripts. During its pre-production phase, a licensing company, Leisure Concepts, sat in on development meetings to assess the marketing potential of the show’s characters. Once the show went into production, Lawrence remembers getting a visit from someone who dropped a moat monster on his desk with a request to write it in. He tossed it in the trash. 10. Those toys can sometimes sell for $25,000. The holy grail of ThunderCats plastic history is the Mad Bubbler, a putrid little creature that burped bubbles and never made it past the prototype stage. Toy dealer (and star of the Travel Channel’s Toy Hunter) Jordan Hembrough tells mental_floss that a painted version he obtained from a toy designer was later sold to a collector for $25,000. 11. Parents began naming their daughters Cheetara. You might call it correlation without causation, but we’d beg to differ: According to the Social Security Administration, no babies were named Cheetara in 1984. In 1985, the year the ThunderCats female lead debuted, seven girls had it on their birth certificate. By 1987, 29 kids were named after her. A total of 81 offspring in the ‘80s had very some very easily-influenced parents. 12. Lobbyists tried to force them off the air. Despite their best efforts to convince viewers otherwise, 1980s television animation was often characterized as being a half-hour toy commercial. An advocacy group, Action for Children’s Television, lobbied to ban shows like ThunderCats and He-Man from the airwaves entirely. In 1990, the Federal Communications Commission ruled that the shows were okay—provided they didn’t advertise their own toy lines during commercial breaks. 13. The ThunderCats met Superman. 14. The 2011 reboot lasted only one season. With nostalgia a powerful economic motivator, Warner Bros. and the Cartoon Network decided to reboot ThunderCats for a contemporary audience. Despite a marketing push and strong ratings, the series only lasted a season—because it didn’t move toys. Creator Shannon Eric Denton told MTV in 2013 that a primetime Friday time slot didn’t help matters. It was a personal disappointment to Denton, who had worked on the updated version for over a decade. 15. James McAvoy would really, really like to see a live-action movie. Images courtesy ThunderCatsFans.org. ThunderCats are trademark and copyright Warner Bros Entertainment, Inc.